Prince Nuada (Luke Goss) attempts to reawaken a sadistic and unstoppable army to kill all humans. 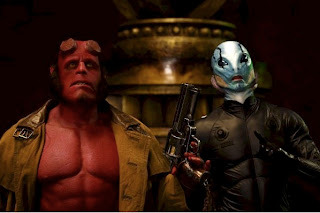 Hellboy (Ron Perlman) and his gang try to stop him. Guillermo del Toro once again presents his spectacular vision of monsters and the fantastic, and it is truly a feast. More "comic book-y" than its predecessor, Hellboy II provides more laughs, even if it means Barry Manilow duets. Abe Sapien (Doug Jones) has a more central storyline this time around--if only that story was worth telling. See, every now and then, there are elements that don't work. Like, say, Abe's romance with Princess Nuala (Anna Walton), which is severely underwritten. Or a dull final battle. Or the fact that when thought about for more than three seconds, the plot makes no sense. Or the bland performances by Selma Blair and the aforementioned Walton. Or Danny Elfman's awful, all-over-the-place score.